Regression models are a cornerstone of modern social science. They’re at the heart of efforts to estimate causal relationships between variables in a multivariate environment and are the basic building blocks of many machine learning models. Yet social scientists can run into a lot of situations where regression models break. Below, I’ll walk through some of the potential pitfalls you might encounter when you fire up your favorite statistical software package and run regressions. Specifically, I’ll be using simulation in R as an educational tool to help you better understand the ways in which regressions can break. 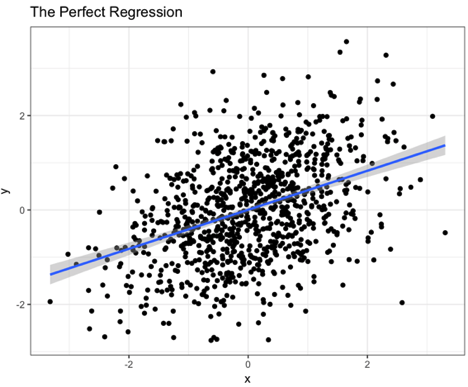 The idea of using R simulations to help understand regression models was inspired by Ben Ogorek’s post on regression confounders and collider bias. The great thing about using simulation in this way is that you control the world that generates your data. The code I’ll introduce below represents the true data-generating process,since I’m using R’s random number generators to simulate the data. In real life, of course, we only have the data we observe, and we don’t really know how the data-generating process works unless we have a solid theory (like Newtonian physics or evolution) where the system of relevant variables and causal relationships is well understood and to which there is really no analogous phenomenon in social science. What I’ll do here is create a dataset based on two random standard normal variables by simulating them using the rnorm() function, which draws random values from a normal distribution with mean 0 and standard deviation 1, unless you specify otherwise. I’ll create a functional relationship between y and x such that a 1 unit increase in x will be associated with a .4 unit increase in y. What about omitted variables? 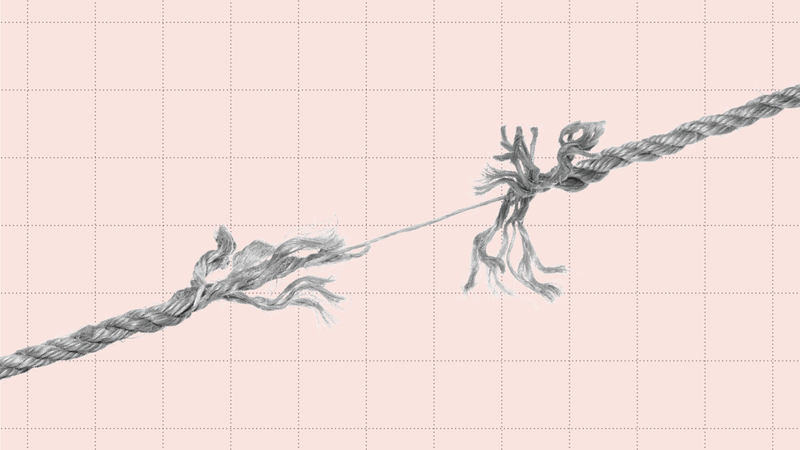 Our machinery actually still works if there is another factor causing y, as long as it is uncorrelated with x. Omitted variable bias (OVB) is much feared, and judging by the top internet search results, not well understood. Some top sources say it occurs when “an important” variable is missing or when a variable that “is correlated” with both x and y is missing. I even found a university econometrics course that defined OVB this way. The example below first demonstrates that w, our confounding variable, will bias our results if we fail to include it in our model. The next two examples are essentially a re-telling of the post I mentioned above on collider bias, but emphasizing slightly different points. There it is: classic omitted variable bias. We only observed x, and the influence of the omitted variable w was attributed to x in our model. If you re-rerun the regression with w in the model, you no longer get biased estimates. So why can’t we just say that OVB occurs when our omitted variable is correlated with both x and y? As the next example will show, correlation isn’t enough — w needs to cause both x and y. We can easily imagine a case in which we don’t have causality but we still see this kind of correlation — when x and y both cause w.
Let’s make this a little more concrete. Suppose we care about the effect of news media consumption (x) on voter turnout (y). One factor that some researchers think may cause both news media consumption and turnout is political interest (w). 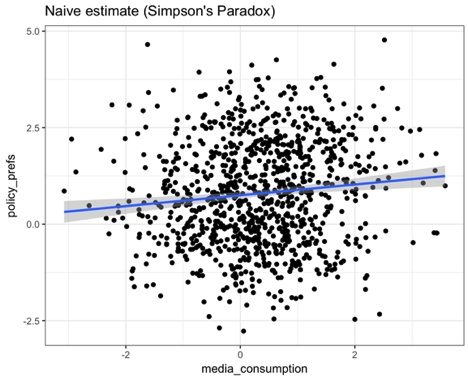 If we only measure media consumption and voter turnout, political interest is likely to confound our estimates. What makes defining omitted variable bias based on correlation so dangerous is that if we now include w (political interest), we will get a different kind of bias — what’s called collider bias or endogenous selection bias. Simpson’s paradox often occurs in social science (and medicine, too) when you pool data instead of conditioning it on group membership (i.e., adding it as a factor in your regression model). Suppose that, all other things being equal, consuming media causes a slight shift in policy preferences toward the left. 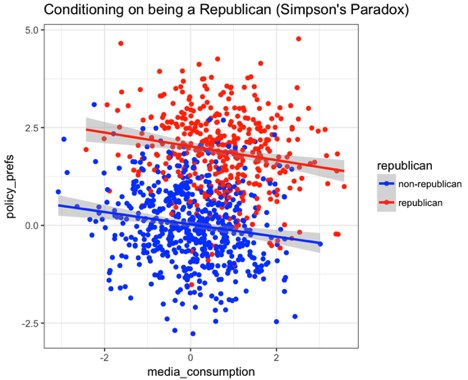 But, on average, Republicans consume more news than non-Republicans. And we know that generally Republicans have much more right-leaning preferences. If we just measure media consumption and policy preferences without including Republicans in the model, we’ll actually estimate that the effect goes in the direction opposite of the true causal effect. To resolve this paradox, we need to add a factor in the model that indicates whether or not a respondent is a Republican. Adding that factor lets us estimate separate slopes for Republicans and non-Republicans. Note that this is not like estimating an interaction term, where two explanatory variables are multiplied together. It’s not that the slopes are different, we just need to estimate separate ones for Republicans and non-Republicans. Another cardinal sin — and one that we should worry a lot about because it often arises from social desirability bias in survey responses — is the phenomenon of correlated errors. This example is inspired by Vavreck (2007). Note that this while most people think about social desirability as being a problem related to measurement error, it is essentially the same problem as omitted variable bias, as described above. It’s important to remember that omitted variable bias and correlated errors are just two potential problems with regression analysis. Regression models are also not immune to issues associated with low levels of statistical power, the failure to account for the influence of extreme values, and heteroskedasticity, among others. But by simulating the data-generating process, researchers can get a good sense of some of the more common ways in which statistical models might depart from reality.